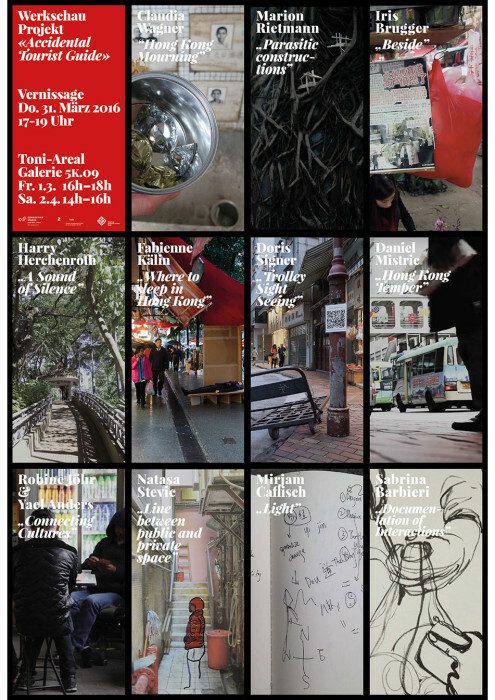 Students of Accidental Tourist Guide are presenting their artworks in this 2-day exhibition. The project focuses on self-awareness and self-reflection in a transcultural context, on discerning differences in aesthetic perception, and understanding differences in intercultural development processes in the field of educational and design projects, and their formats. Together with students from Polytechnic University School of Design (PolyU) in Hong Kong, and design researchers King Chung Siu and Albert Tsang, twelve students from the Zurich University of the Arts (ZHdK) will have the opportunity to explore the possibilities of social and cultural life as well as the urban structures of a specific area in Hong Kong, focusing on the gentrification process of the neighbourhoods of North Point (neighbourhood of Connecting Space Hong Kong) and Hung Hom (neighbourhood of PolyU Campus).